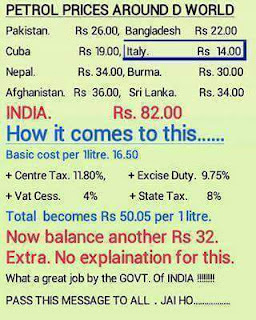 A misleading post regarding petrol prices in India and Abroad is doing the rounds (again!). Let's look at the accuracy of each of the above claims, just so we learn that the purpose of any media needs to go beyond the reconfirmation of the reader's preconceived notions. As we can see clearly, not only is the data clearly misrepresented, but we can see how ridiculous the bias in "reporting" is. Italy and Cuba, purported to have the cheapest petrol on the list, actually have the most expensive. India, whose government the creator of the image so callously dismisses, is the only location with over-reported prices. Not to mention, prices vary way more based on crude prices, than on variation of taxation, given a fixed jurisdiction. Please, at least try to fact check random posts by people about "facts" and "data", before you jump to share and retweet these posts, and further contribute to the spread and celebration of misinformation. Note that these prices are mostly accurate as of early March 2016, and may vary considerably base on a variety of factors. P.S. And what is the deal with the .00 after every price in the image. I though significant digits were, well, significant.